This is the lineup. But subject to change. Please come out, have fun and support our fundraiser to help support our kids in their Music and Color guard programs. 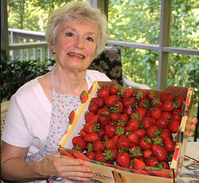 The Soddy Daisy HS Band is now selling Strawberries. The strawberries are from Plant City, Florida. These are winter strawberries because they will be delivered during the first half of March. We are selling these in Flats (approximately 6.5 pounds) and they are $20 per flat. Order forms were sent home with students today and can be picked up in the band office. You can also download the order form in pdf form below. Money is due when the order is placed. ORDER DEADLINE IS FRIDAY, FEBRUARY 26th. Orders can also be placed via credit card online at www.dandanberryman.com. ALL ORDERS WILL BE DELIVERED TO THE SCHOOL!! Below is the itinerary for the Summit HS Winter Guard show this weekend. If you have any questions, please contact Mr. Light in the band office.